This week, Ford made a number of announcements during its press conference at the 2016 International Consumer Electronics Show (CES), taking place this week in Las Vegas. It was rumored the car maker would announce a joint venture with Google to build autonomous cars, but that is not what happened. Instead, Ford revealed a new partnership with Amazon and dronemaker DJI, as well as additions to console software and “infotainment” systems. Although the carmaker plans to test its self-driving cars this summer, Ford makes it clear that its priorities are focused on advancing in-auto technologies. Despite reports in December from “inside sources,” it appears that Ford will not be launching a separate company with Google for the purpose of building self-driving cars. In interviews conducted Monday and in this morning’s announcement, CEO Mark Fields suggested that Ford leaders may have met with other companies to discuss an autonomous car project, but that nothing came from it. Rather than pursuing a deal with Google or any other major player in the autonomous car realm, Ford will continue its own efforts. “Ford is tripling the size of its autonomous vehicle testing fleet,” said Fields. The CEO reaffirmed the promise to release 13 “electrified” cars to market by 2020, corresponding to a $4.5 billion investment by the company. He also expressed the company’s desire to dip into the “mobility” market by launching its Smart Mobility pilot program. This is an effort to grab a slice of the pie that is currently dominated by rideshare programs and cab services, according to Fields. Ford also promised that two long-awaited platforms will be added this year: Apple’s CarPlay and Google’s Android Auto. This means all 2017 Ford models in North America with the company’s Sync 3 infotainment system will have those options right off the lot. Owners of 2016 models will be able to “upgrade” later in the year. The 2017 Escape will the first vehicle model with the new capabilities to go on sale this spring. Fields also announced that Ford is working on equipping vehicles with mobile Internet from AT&T, while encouraging other automakers to use Ford’s in-car entertainment and navigation system in their own vehicles. 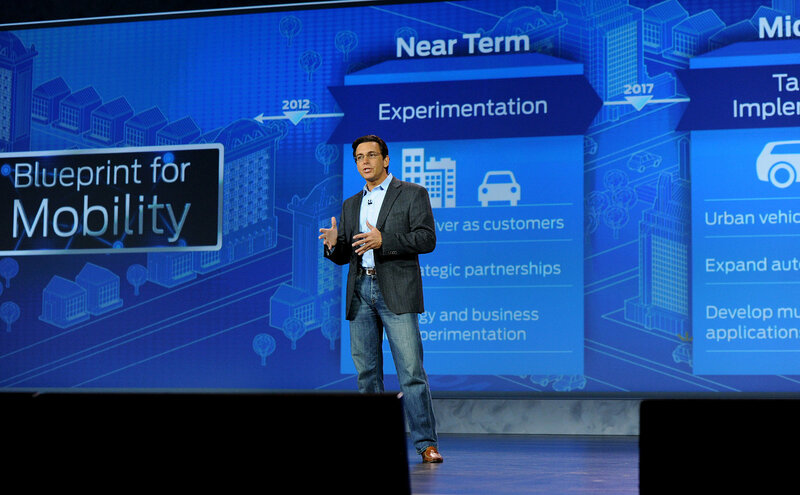 Ford CEO Mark Fields, shown here at CES 2015, announced a slew of new features this morning. Ford will release 13 "electrified" vehicles by 2020.